A new set of watercolor classes will start Tuesday, April 16 in my downtown studio. Class is geared toward beginner and intermediate students and the size is limited to six people. The morning class is full, but there is still space in the afternoon class, from 1 to 3pm. You’ll learn a lot, laugh a lot, and discover the artist within you. There’s lots of individual instruction and lessons make each class a learning experience. Cost of the six week class is $60, with a $35 materials fee for new students. That includes a palette loaded with paint, one brush, a support and top quality watercolor paper. Please call me to sign up, 360-887-2160, before Monday, as I need to buy the palette. The RHS Performing Arts Department is currently preparing for “Chicago”, our annual spring musical production. Kaitlyn Etter (RHS Theater) and I are in search of instrumentalists in the Ridgefiled School District and Ridgefield community to volunteer their time and talent to serve as musicians for the pit orchestra. If you are interested or know of someone who would be interested in volunteering for the show, please let us know at your earliest convenience. Unleash your creativity in a relaxed, positive atmosphere and watch your amazement grow as you create an original water color painting. 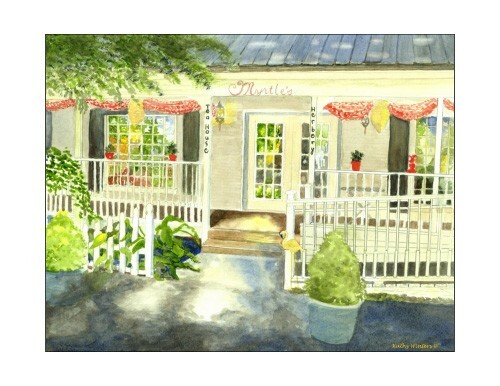 Our next series of watercolor classes start Tuesday, October 30 from 9 to 11 am at my home studio in downtown Ridgefield. Lots of individual instruction for a small group of students. Cost is $60 for a series of six lessons. Call today to register – this class fills up quickly and is limited in size. 360-887-2160 or kathywinters179@gmail.com. Saturday Night Party with Onsite Babysitting! – ‘like its 1999! Downtown Saturday Night Party, August 25th, 7:30-11pm at the Ridgefield Art Space, upstairs above the hardware store. Come see what The RAS is all about. Being a nonprofit arts center for Ridgefield, we have classes starting soon of all types – Ballet, Hip Hop, Partner Dancing, Zumba, Baby and Me, Comedic Acting/Stand Up, Date Nights, Paint ‘n Sips, Painting Instruction, a soon to be opened Teen Lounge for weekend nights and so much more coming! Come party and meet us…And don’t worry about the kids, we’ve got you covered! Best date night ever in less than two weeks!! Live Band … Huge Dance Hall… Mingling… Disco ball and great acoustics …Beverages 😉 You can “catered bar” your face off! Meet our instructors …Safe transportation home… Onsite Babysitting by Red Cross Certified Sitters in adjoining suite for $5/child. Not per hour- Just five bucks per child for the whole night! Taxis out front- we have 23 stairs up to our second floor palace above the hardware store. If you have trouble getting down them you and yours GET IN A CAB. They’ll be waiting out front. Come out for a night of fun. Make new friends and high five your old ones. See our schedule and the soon to be opened Weekend Teen Lounge. 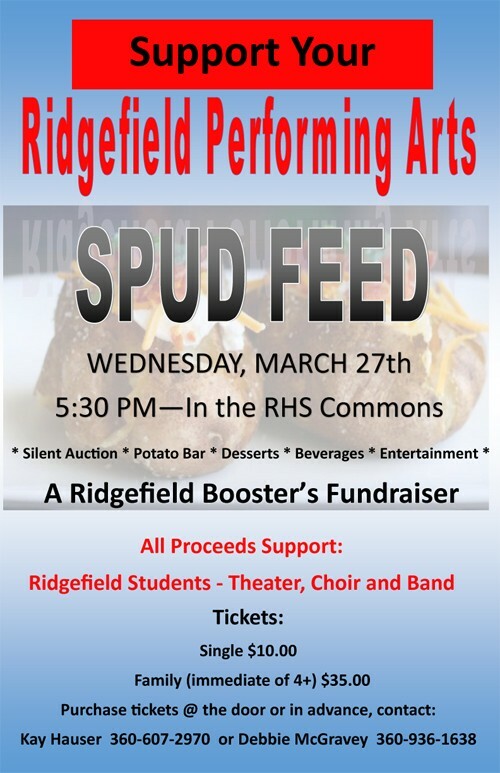 Tickets are $15 and support your neighbors’ access to awesome events, visual and performing arts classes, and a place where everyone in Ridgefield is welcome to make memories. One of every four people taking our classes are not asked to pay based on their private financial situations. Your fun pays for theirs too! Get your tix now at www.The-RAS.com The RAS- Nonprofit Arts For All.. Somewhere there’s a party… SOMEWHERE is up there! 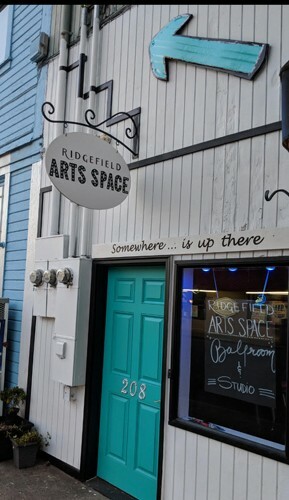 New to Ridgefield, The RAS- Ridgefield Arts Space, can be found just above the hardware store at 208 Pioneer, in downtown. The RAS is established to provide a place of arts, learning and events granting access to artistic, social, and educational experiences regardless of economic standing. The effort aims to maintain and enrich a true sense of community in and for Ridgefield, by the charitable contributions of the residents of Ridgefield. As a federally registered pending 501(c)(3), Non-Profit organization, a significant portion of every class/event registration dollar—be it for Ballet, Hip Hop, Comedy Improv, Baby Camp; Me classes, Summer Arts Camp, Teen Lounge Nights, or on “RAS Bucks” to buy your sweetheart a drink after dancing at our Date Night event, a significant portion silently goes to provide these very same experiences to those of us whose budgets simply cannot accommodate such extras. If you are one of the folks whose budget can’t afford access to the arts, but also want these enriching experiences for your family, please reach out to us and know that your privacy is secure. If you would like to sign up for classes, or to donate additionally please also email info@the-ras.com, call (360) 947-4484, or visit www.The-RAS.com. To kick things off for the month of August, if you present a single receipt from ANY business in Old Town Ridgefield, you will receive $5 in “RAS Bucks” for every $25 spent. This will be a big week in Ridgefield, with the Garden Club Plant Sale, the Ridgefield Art Association’s Spring Show, First Saturday’s doings, etc. I’ll be putting in snippets of what the expect during the coming week. 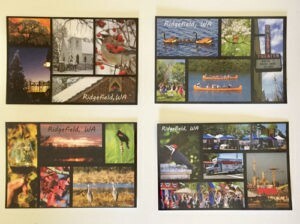 The Art Association will sell postcards, as shown at left, as well as 6 x 6″ pictures painted by the members. The original paintings sell for $30 each, and will go fast I’m sure, so get there early. Look for them under the big tent at Overlook Park. Unleash your creativity! Come to my watercolor class, starting next week, Tuesday, Mardh 13. We’ll have fun and you’ll learn simple ways to make beautiful paintings. This class is for beginner and intermediate painters, even those who have never picked up a brush or say they can’t draw a straight line. There’s a lesson planned for each day, and it’s fun to paint with others and get ideas from them. Is football NOT your thing? Come join Maureen at her next Paint and Pour being held at Koi Pond Cellars on Feb. 4th from 3:00 – 5:00pm. All materials are supplied and the price ($40) includes one glass of wine. No experience necessary. Give watercolors a try! You might be surprised at what you can accomplish. Koi Pond’s new tasting room is located at 24211 NE 41st Ave, Ridgefield, WA 98642. Please call Michelle (360) 281-2716 to reserve your seat. Sorry, no walk ins. Lava Java coffee shop (2 South 56th Place suite 102) will host a Paint and Sip event on Sunday, January 28th from 2-4pm . No experience needed, open to 12 years and older. Taught by local watercolor artist, Maureen O’Reilly, the session includes all necessary supplies plus a signature cup of coffee. Cost is $40. Please call to reserve your seat: 360-887-3980. 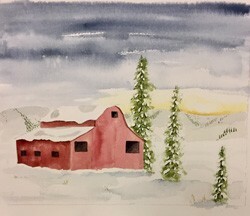 Local artist Maureen O’Reilly will be at Koi Pond Cellars new tasting room teaching how to paint this winter scene. The session is on Sunday, January 21, from 3-6. All materials are provided plus one glass of wine. Cost is $40. No experience needed. Please call Michelle at the winery, 360-281-2716, to reserve your place and get the new address for Koi Pond. 21 and over, seats are limited. It’s not too late to register for my water color class that starts Tuesday, January 9, from 9 to 11 am and runs for six weeks. 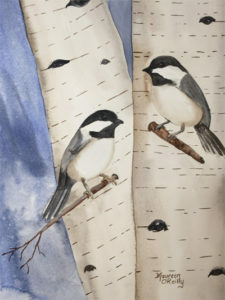 Beginners and intermediates will enjoy this fun-filled class, and come away with a couple of great paintings. Bring a reference photo that you’d like to paint, and we’ll go from there. Class is held in my bright and cheery downtown studio. Beat the winter blues! Learn how to paint in watercolor. You’ll love it! Cost for the series is $99, and you need to register at 360-887-2160. Now that the holidays are over, it’s time to think about how you’ll get through these dark dreary days of winter. 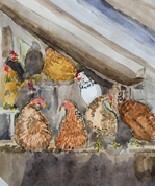 Unleash your creativity by taking my watercolor class! It starts next Tuesday, January 9, from 9 to 11 am, and runs for six weeks. This class is for beginners through intermediate. We’ll start each day with a short lesson and a chance for you to practice the technique you’ve learned. The rest of the session will be spent painting. You’ll have individual instruction as well as learn from the others in the class. We’ve had success with folks who have never picked up a brush before, so don’t be shy – call today. The class is held in my bright and cheery studio in downtown Ridgefield and costs $99 – a real bargain. Call me at 360-887-2160 to reserve your spot – space is limited. 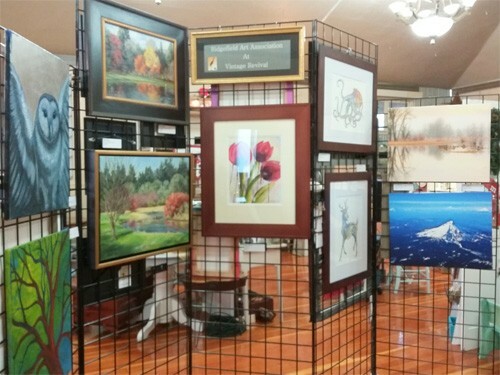 ​Ridgefield’s newest home décor store will host an art exhibit and sale by many members of the Ridgefield Art Association December 29th through January 19th. Stop by and say “Hi” to our gracious host and owner of Vintage Revival, Dee Gaudet, who has been a wonderful addition to our community. Vintage Revival is located at 418 Pioneer in Ridgefield and is open 10-6 Tuesday through Saturday, 12-4 Sunday and Monday. Dee also has a small collection of my hand painted greeting cards for sale. Ridgefield Arts Experience is seeking the use of a story written by a local author for an integrated youth arts experience including a performance of the story. The experience will be March 22, 2018, and the author will have the opportunity to be present during the production, including a book signing. Ridgefield Arts Experience is a collaborative production which integrates musical, literary and visual arts for school age participants. The experience is open to elementary and middle school students who have the opportunity to make costumes and scenery, compose and perform music, and enact the chosen story. Please send a resume and examples of your work to Barbara AW Wright bawwrightseta@hotmail.com by December 15.